Is Will Smith in the building? 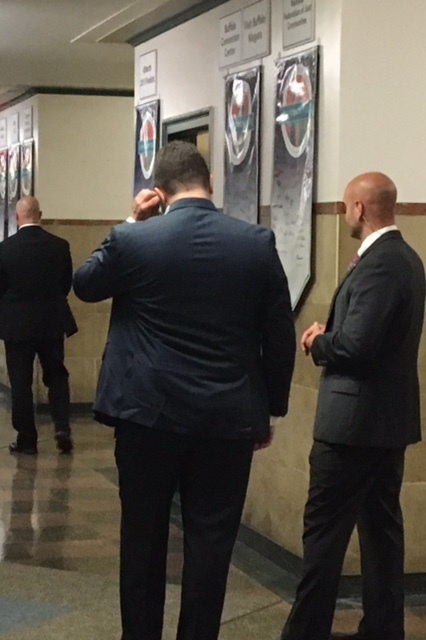 A bunch of Secret Service-looking men drew a lot of attention at City Hall on Thursday morning. At about 8:30 a.m. – a time when many workers and visitors are entering the building – a whole bunch of men in black suits were stationed in and around the building. Word is that Homeland Security's field office held a meeting here in Council chambers on the 13th floor. That’s not an official word, though. In fact, no one would say officially what was up. City Hall security guards were mum. Mayor Byron Brown’s people weren't saying. I even asked one of the men in black what was going on. But I was able to get some solid intel from a colleague who’s in the know, some off-the-record comments and what I heard in the hallways. Wishing everyone a safe and enjoyable Fourth of July! Here's a list of fireworks displays in Erie and Niagara counties. Find one near you or try something different. Be sure to click us back on later next week.